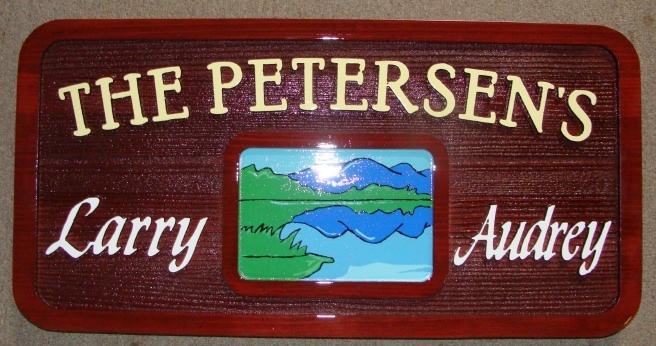 This beautiful vacation home plaque has a sandblasted redwood substrate with raised letters and border, and an outdoor digital vinyl applique of the mountain lake scene. This applique will last just as long as an artist-painted scene using oil paints, and is less expensive. The sign is clear-coated twice for additional UV and weather protection. This sign can be mounted on a door, an adjacent wall, a gate, on a metal or wood post, or hung from a wood or iron hanger.